Here a big reason to celebrate ‘Back To School’ time! 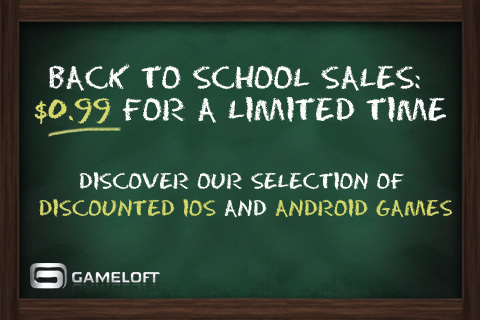 Gameloft has slashed the prices of loads of their best games. Grab universal apps like BackStab or Silent Ops, or the iPhone or iPad releases of N.O.V.A. 2 (and many more) for just 99¢ each. That’s a savings of as much as $6 on some of these games. ← If Ever There Was An Ideal Mobile Game, Halfbrick’s Jetpack Joyride Would Be It!